Kids die from injuries sustained in accidents more than anything else, and that’s tragic enough but it gets worse: statistics show that many of these unintentional injuries could be prevented if certain steps had been taken in advance. Kids are dying and they don’t have to die: that’s the bottom line. The Centers for Disease Control has released a report named “National Action Plan for Child Injury Prevention” which catalogs all the scary statistics surrounding child injuries and deaths due to accidents as well as offering suggestions for how to better protect our kids from harm. Childhood unintentional injuries are the leading cause of death among children ages 1 to 19 years. Childhood unintentional injuries are nearly 40 percent of all deaths in this age group. Every year, 9,000+ die as a result of these injuries. One child dies from accidental injuries every hour. 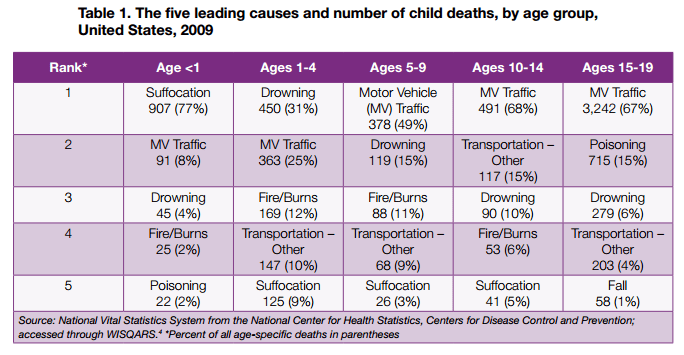 25 children die every day from unintentional injuries. transportation-related injuries (like car crashes). Many of these accidents could be prevented — if those responsible for watching over kids (teachers, coaches, camp counselors, baby sitters, nannies, etc.) as well as parents were aware of these very real dangers and knew how to prevent them from happening. Who Is Responsible for Keeping Kids Safe? Anyone who has a duty to watch over a child of any age (infant to teen) has a legal responsibility to take reasonable measures for keeping that child safe. What that duty entails depends upon the age of the child and the circumstance: for example, small children taken for a ride in a motor vehicle need different safety steps than a 15 year old passenger will. Kids playing football need different helmets and safety gear than those playing tennis. You get the idea. Trouble is, lots of people don’t. There are too many people entrusted with the responsibility of watching over children that are not protecting these kids. Delivering actionable, persuasive communication strategies to those who can affect change is crucial for reaching these objectives. At the core, communication strategies need to target the primary audiences of children, teenagers and their families (and their schools and communities), who need to adopt, implement, and maintain effective injury prevention practices. Communication strategies that reach those who influence these primary audiences and those who can influence broader structural change are equally vital. Injury prevention communication needs to reach leaders and decision makers with consistent, compelling, and accurate messages. If your child has been injured or tragically died in an accident (unintentional injury) then you may some valid questions regarding why and what has happened. A good piece of advice if your children have been harmed in an accident, is to at least speak with an experienced personal injury lawyer before you file a claim to learn about some of the issues that can arise with these claims, including the type of evidence needed to prove a claim and the type and amount of damages you can recover. Most personal injury lawyers, like Alan Sackrin, will offer a free initial consultation (over the phone or in person) to answer your questions.